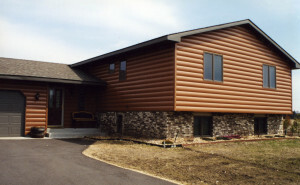 Seamless steel log siding offers homeowners in the Minneapolis, Minnesota area the look and feel of a rustic log cabin, but without the unending maintenance issues that wood logs require. DuBois ABC Seamless has been installing log siding products on homes in the region since 1980, helping homeowners achieve the charming, natural look of unfinished wood without ever having to worry about cracks, insects, rotting, or other problems that come from a material that naturally deteriorates over time. Our seamless siding materials are made from 28-gauge, G-90, hot-dipped galvanized steel and are fabricated on site, using the precise measurements from your home. That enables us to create singular panels that stretch from corner to corner, eliminating seams that can collect dirt or allow outside air to infiltrate inside your living space. Astounding variety – Our siding products come in a wide array of styles and colors, including dozens of colors in two-tone, high-definition, and woodgrain patterns to give your home the exact look you desire. Unbeatable coverage – We stand behind our siding products with a Lifetime Material Warranty and a 10-year workmanship warranty, so you won’t have to worry about shoddy products or craftsmanship. To learn more about our log siding and how it can help improve your home in Minneapolis, MN, or any surrounding community, contact the pros at DuBois ABC Seamless today. Buy 3 Windows Get One Free — There's Never Been a Better Time to Buy!